The Ferris Waterpower 200 is one of the most powerful & reliable power products on the market. 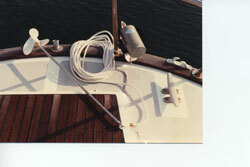 On a blue water passage it can supply the entire electrical needs of a well-equipped cruising sailboat! The FERRIS WP-200 operates silently and efficiently, converting boat motion through the water into electricity, producing up to 200 Amp-hours per day. The Waterpower 200 easily converts to a FERRIS WINDPOWER 200 Wind Generator for extended stays in port. The WP 200's are pre-wired and ready to install. The Wind/Water Generator Monitor is part of the Waterpower 200 system. It contains an ammeter that displays charging current from the generator while underway. We offer the base Waterpower 200 System and also offer a packaged system with the common cruising spares, all bundled together at a package price. We also offer a variety of optional spare & replacement parts to the system, so that you can customize the system to your needs. The FERRIS WATERPOWER 200 Generator System can easily produce 200 Amp-hours per day on an ocean passage! In most cases that power on its own is enough power to operate the boat 24/7, while underway. The Ferris WP-200 Water Generators have been used by cruising and racing sailors since 1975! Installation and operation are simple: The generator is mounted in a gimbaled frame on the stern of the boat. A stainless steel spinner, connected to the generator by a torque line, trails in the water behind the boat. High Output and Completely Silent! Easily converts to a WP-200 Wind Generator for extended stays in port!